Thought that cutting the rings open on a 6-pack was enough, unfortunately it’s not. 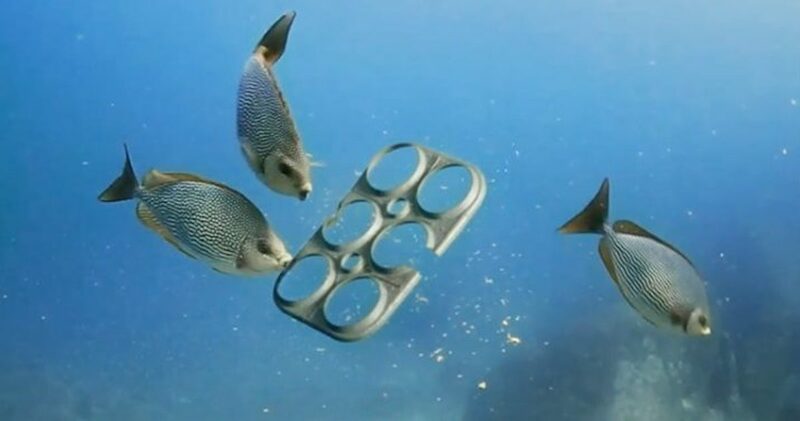 Sea turtles, fish and marine mammals still ingest those plastic beer rings, so SaltWater Brewery invented edible six pack rings. Hopefully other breweries will follow suit. The devastating effects that plastic six-pack rings can have to both wildlife and the environment have been proven time and time again. Huge thumbs up to SaltWater Brewery for this fantastic eco-friendly invention! What are the edible six pack rings made of? These six-pack rings are 100 percent biodegradable and edible—constructed of beer byproducts, like barley and wheat that are leftover from the brewing process. This packaging can actually be safely eaten by animals that may come into contact with them. Also, if the product ends up in the ocean, they will safely disintegrate. The design is just as strong as plastic packaging but it’s more expensive to produce the company said. However, it hopes customers will be willing to pay a bit more in order to help the environment. We hope other breweries will jump on the bandwagon and make safer 6-pack rings for our marine friends. You’ve probably noticed that you get a bit dozy after having a drink (and you even sleep more and dream more vividly than usual), but have you ever wondered why? Do you drink while striking your best Warrior Pose? Do you get to drink beer after the class is over? Is this some cruel ploy to get me to exercise? The answer, it turns out, is yes to all three. Not just one more reason to drink beer, but 10.